Danny Meyer sets a table of ideas about hospitality and how to practice it. Meyer is a world-renowned restaurateur, but these are ideas for any organization or anyone who wants to learn how to deliver exceptional people-oriented service; hence his subtitle: The Transforming Power of Hospitality in Business. 1. Enlightened Hospitality: Extending gracious hospitality to one another (whoever wrote the rule that the customer is always first), our guests, our community, our suppliers, and finally investors. 2. Pay attention to the early years: Meyer's years, like those for all us, were telling. This was less a hospitality note, than a parenting note. Meyer's reflections on his upbringing make me want to say to every parent, prospective parent, and educator: "Pay attention to the early years!" They are formative for the future. Study them. Don't push your projections of what you want your kid to be. 3. the Salt shaker principle: "Your staff and guests are always moving your saltshaker off center. That's their job. It is the job of life. It's the law of entropy! . . . It is not your job to get upset. . . . Your job is just to jove the shaker back each time and let them know exactly what you stand for." This is from chapter 9, "Constant, Gentle Pressure." Page 188. 4. 51 Percenters: I would buy the book for the lesson of the 51 percenters (chapter 7, "The 51 Percent Solution"). "The only way a company can grow, stay true to its soul, and remain consistently successful is to attract, hire, and keep great people." The secret: Hire for 49 percent technical expertise; 51 percent innate emotional skills for hospitality. You've got to read the chapter. 5. Who ever wrote the rule? : This was both a chapter title (chapter 5), and a recurring theme. Meyer bucks traditional thinking at many places with that question. In doing so he made me rethink effectiveness and how to achieve it. I serve in a church and with an educational institution. I have children in sales and in the restaurant business. 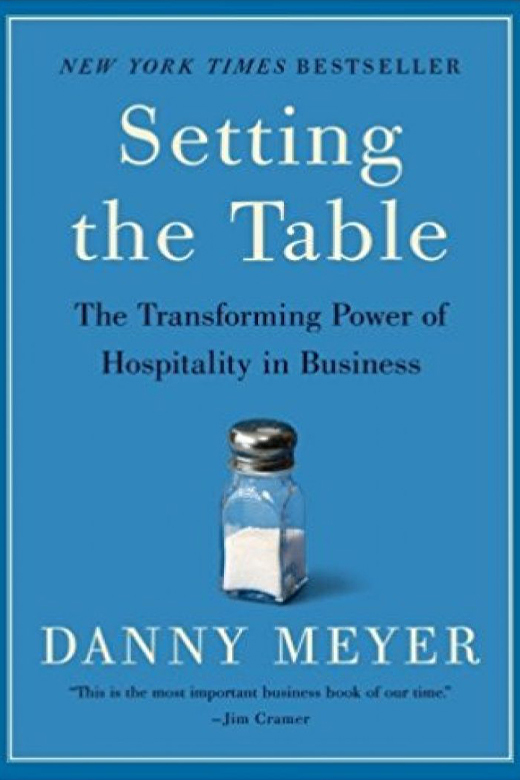 Setting the Table: The Transforming Power of Hospitality in Business is must reading (at least "must gleaning") for transforming effectiveness in those environments and in life.